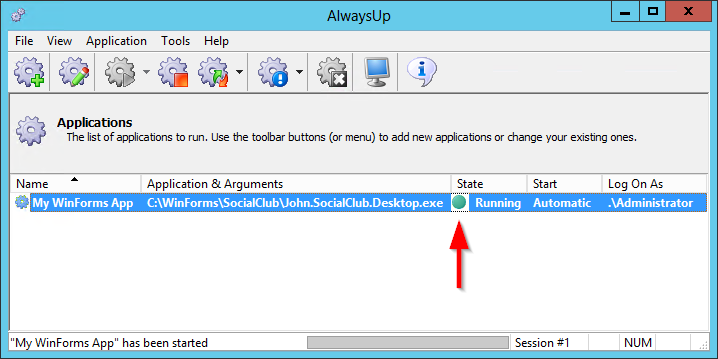 Automatically start your WinForms GUI in the background as a Windows Service, before anyone logs on. No need to modify your code! Windows Forms (WinForms) is a widely-used GUI API included with the .NET Framework. 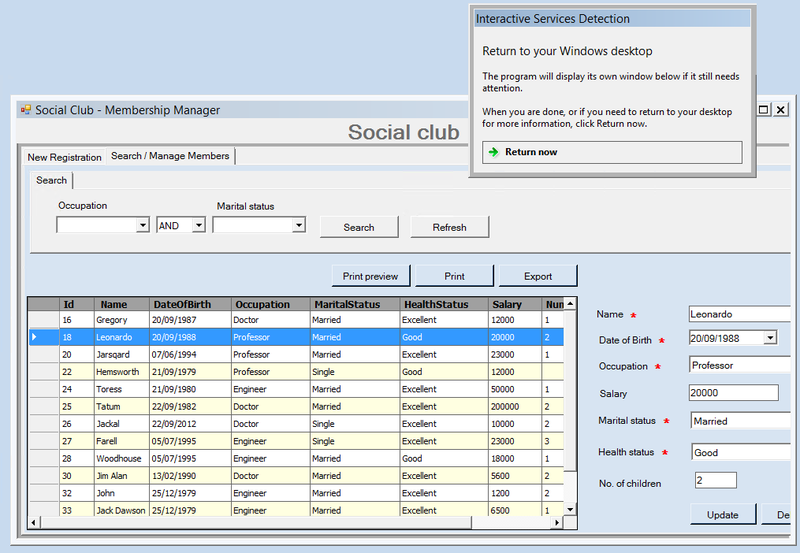 Prior to the introduction of WPF in 2006, WinForms was the API of choice for .NET applications presenting a graphical user interface. In the Application field, enter the full path to your WinForms application. and that will appear throughout. No doubt the path to your application will be different! In the Name field, enter the name that you will call the WinForms application in AlwaysUp. We have entered My WinForms App but you can specify virtually anything you like. Click over to the LogOn tab and enter the user name and password of an account that can run your WinForms application normally. 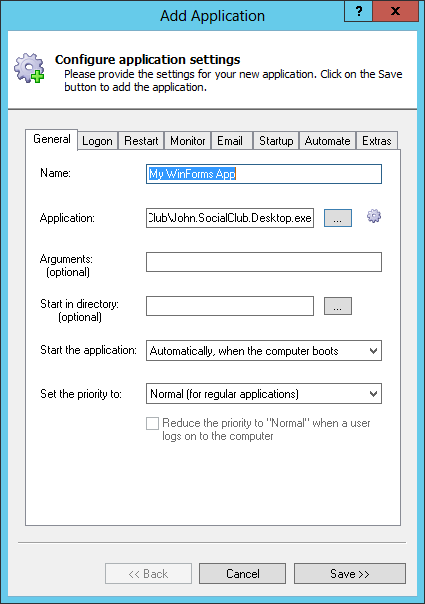 Without this, your application may not find its settings (registry, permissions, etc.) and fail to run properly. And if you wish to completely hide your WinForms GUI from prying eyes, you should check the When a user logs on, don't show the application's windows and tray icons (if necessary) box. However we recommend leaving it unchecked at first - until you've gone through this process and validated that your application is working well. You can always activate this option later on. 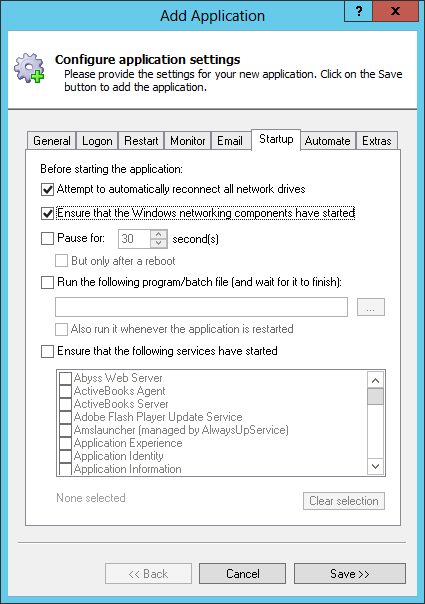 If your Windows Forms program needs the network to do its work, click over to the Startup tab and check the Ensure that the Windows Networking components have started box. Click the Save >> button. 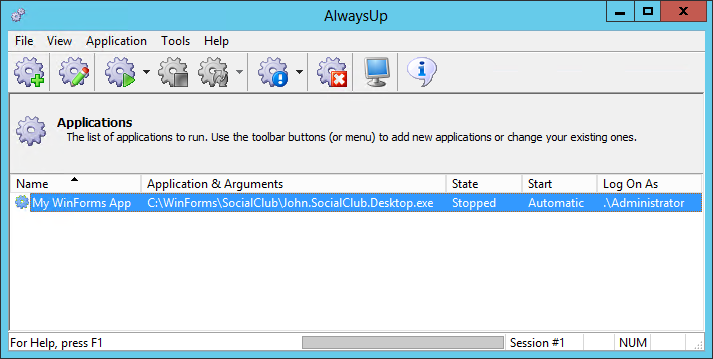 In a couple of seconds, an application called My WinForms App will show up in the AlwaysUp window. It is not yet running though. Note that if you checked the box to hide the GUI in step 5, you won't see anything in Session 0 (or be pestered by the Interactive Services Detection Dialog). That's it! Next time your computer boots, your WinForms application will be launched immediately, before anyone logs on. Please reboot your PC now to test that everything works as expected. 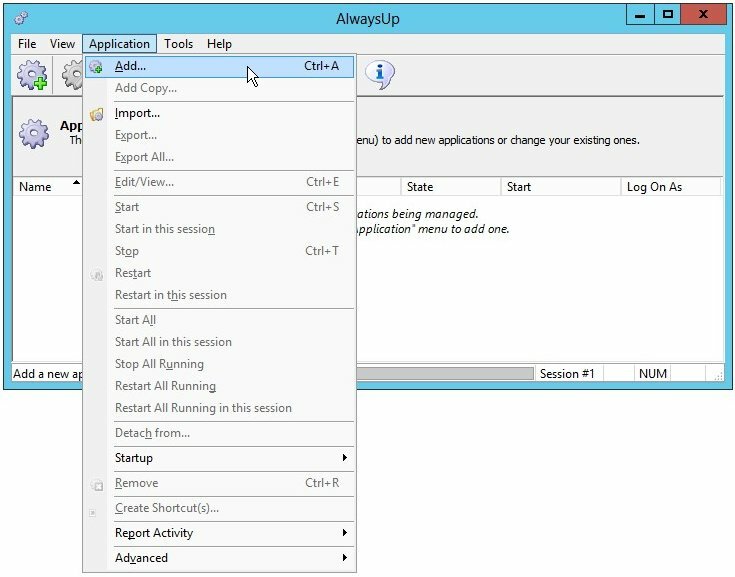 Afterwards, be sure to explore the other settings in AlwaysUp that may be helpful in your situation. Configure email alerts when the application fails, restart it nightly to clear out memory leaks, and much more! WinForms program not working properly as a Windows Service?